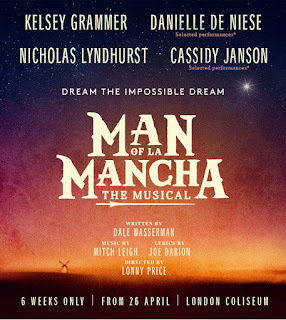 Updated 15th March : West End leading man Peter Polycarpou, Only Fools and Horses actor Nicholas Lyndhurst and West End leading lady Cassidy Janson will join the new revival of Man of La Mancha at the Coliseum. Janson, appeared in Chess at the same venue in 2018. She will share the role of Aldonza and Dulcinea with opera singer Danielle de Niese. De Niese will do 33 performances and Janson 17. Lyndhurst will play the Innkeeper and the Captain. His previous theatre credits include Carousel at the Coliseum, and Trevor Nunn's The Tempest at Theatre Royal Haymarket. 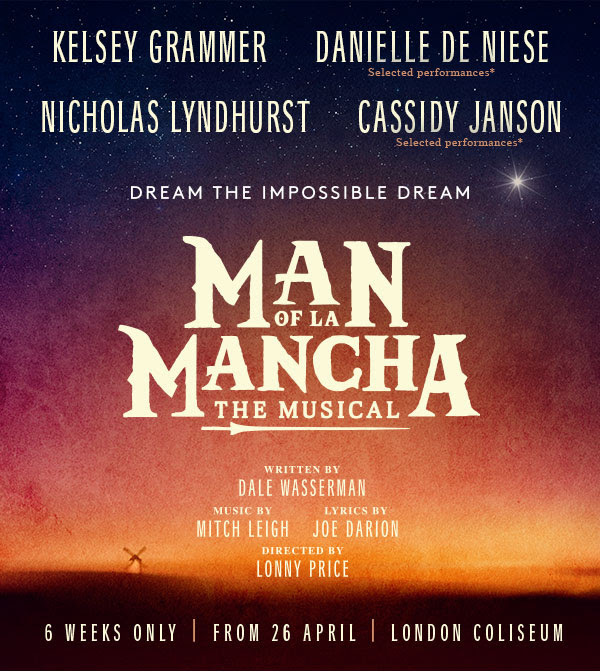 TV, film and theatre star Kelsey Grammer (Broadway: La Cage Aux Folles, Finding Neverland, London: Big Fish) is to star as Miguel de Cervantes and Don Quixote in an ENO concert production of the musical Man of La Mancha directed by Lonny Price. Australian-born lyric soprano Danielle De Niese has been cast as country wench Aldonza, who becomes Princess Dulcinea in the hallucinations of Quixote. The concert production of the musical, based on the classic tale of Miguel de Cervantes’s Don Quixote, will be presented by the English National Opera running from April 26th-June 8th, 2019. Considered one of the greatest musicals of all time, Man of La Mancha is famous for its inspiring story exploring the noble themes of idealism and courage in the face of despairand and memorable songs including "I, Don Quixote (Man of La Mancha)", "Dulcinea", "It's All The Same" and the iconic anthem "The Impossible Dream".